Besides the fact that this was historic day in SEC basketball with four games going to overtime for a total of nine extra periods, the most significant development was Alabama's blown 10-point lead at LSU, and the ensuing ripple effect. 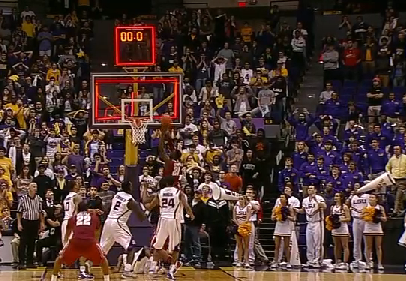 It was a 12:47 CT tip in Baton Rouge. My flight out was at 3:40. According to my GPS, the airport is 13 minutes from the Maravich Center. It was a dicey decision to begin with, but my chances were good barring any unforeseen delay or overtime. I took care of the things I could control, making sure I ate (finding breakfast in Baton Rouge on a weekend morning ain't easy), packing up the tapes and printing out my boarding pass before the game. I wanted to make my flight, but as always I had a job to do that superseded that. The first roadblock was when the AcroDunkers came out at halftime and destroyed one of the nets. There was a 10-minute delay while arena maintenance threaded a new one. We fumbled around for a few minutes creating exhilarating TV while the basket was repaired. But it was a fairly run-of-the-mill 2nd half. Alabama came into the game 10-3 in the SEC but very much on the NCAA tournament fence because of a number of early-season stumbles. They seemed to have the game (and their destiny) well in hand leading by 10 with 2:52 left. They were led by the brilliant lead guard play of Trevor Releford (who wound up with 36). It was going to be a regular off-air with a hero interview and I was just a few dozen steps from my rental car. 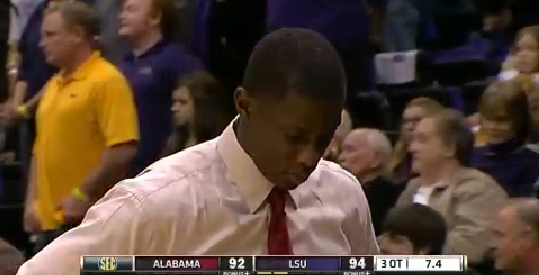 But LSU closed regulation with a tenacious 10-0 run, and we were headed to OT. One of our tape guys, funny man that he is proclaimed "Now boarding Zone 1. Zone 1." I got a chuckle out of that myself, I had pre-planned Plan B, which was a drive to New Orleans while holding for emergency travel on the 75-minute drive. But that was all for the not-too-distant future. We had an overtime (or three) to get through. The end of the first overtime was fairly dramatic. Alabama thought they'd won at the buzzer on a tip-in, but it was waved off as being too late. The end of the 2nd OT was bizarre as LSU's Anthony Hickey, another one of the game's heros with 7 assists and 5 steals, inexplicably dribbled out past the 3-point line and launched in a tie game to try to beat the buzzer. When LSU had finally survived in the 3rd overtime, you could almost hear my plane in the skies above the Baton Rouge campus. As it turns out, triple overtime was outdone a couple of hours later when Tennessee survived at Texas A&M in 4 overtimes. But I didn't learn about that until I was already at New Orleans International, where I emerged from a stand-by list to get to Charlotte and then home to Savannah before 1 AM. So my 20-hour day ended where it should have, even if it was after it should have been. You feel for Alabama who was so close. But from a selfish standpoint, the LSU team is becoming an interesting little bunch as well, and I have them the next two Saturdays. I'll take the drama, but let's make sure we do this in a timely fashion two weeks from now. Thank you.